October 31, 2010  Jon Stewart and Stephen Colbert weren't the only funny ones at The Rally to Restore Sanity and/or Fear on the National Mall Saturday. Here are some of the signs we spotted throughout the day. 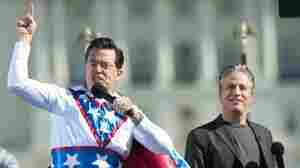 October 31, 2010  Tens of thousands of people got together Saturday on the National Mall with comedians Stephen Colbert and Jon Stewart. The Rally to Restore Sanity and/or Fear was mostly a good-natured riot -- a laugh riot, that is. October 31, 2010  Despite expelling hundreds of Roma this summer and passing an immigration bill that critics call "harsh and discriminatory," France remains a beacon to immigrants. NPR's Eleanor Beardsley, an American living in Paris, recently had her own brush with French immigration authorities. 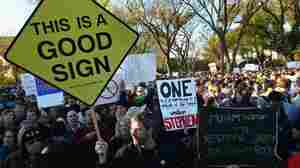 October 30, 2010  We look at some of the highs and lows of Jon Stewart and Stephen Colbert's big rally on the National Mall, from words forgotten to words painted in great big fonts on signs. October 30, 2010  My candidate didn't win the Chicago City Council race, but at least I got to see how politics could be tough but good-natured. It makes me wonder about young people in campaigns today who think the goal is mutual annihilation. October 30, 2010  The ancient Greeks did it. Shakespeare mastered it. Will Rogers mass marketed it. Even educated fleas did it. And now, Jon Stewart and Stephen Colbert may be taking political satire and humor to a new level. Host Scott Simon talks to Peter Sagal, host of NPR's Wait Wait, Don't Tell Me, about the influence of comedy on politics, and vice versa. October 30, 2010  With three days to go until Election Day, host Scott Simon talks to NPR political editor Ken Rudin about the tight races for U.S. Senate in West Virginia, Illinois and Nevada and predictions for the outcome of races in the House. Unemployment: Is Anybody Working On It? October 29, 2010  Nate Beeler and Paresh Nath ask, is it anybody's job one? October 29, 2010  Guest blogger Jimi Izrael takes readers through some of his favorite scary movie performances of all time. October 29, 2010  Host Michel Martin and producer Lee Hill, the program's "digital media guy," comb through listener feedback and offer important news updates to recent conversations on the program. Hear listener reactions to NPR's recent termination of news analyst Juan Williams." Also, a 22-year-old Tennessee man is headed to prison after his 2008 plot to assassinate then-presidential candidate Barack Obama. 'Shop Talk': Should Kendrick Meek Stay In Florida Senate Race? October 29, 2010  In this week's installment of The Barbershop, host Michel Michel Martin talks with author Jimi Izrael, civil rights attorney Arsalan Iftikhar, syndicated columnist Ruben Navarette and screenwriter and graphic novelist John Ridley. They discuss former U.S. President Bill Clinton urging Florida Democrat Kendrick Meek to drop out of the Senate race in Florida; Stephen Colbert and John Stewart's "Rally to Restore Sanity and/or Fear" that will take place in Washington D.C. this Saturday; California GOP gubernatorial candidate Meg Whitman's recent comment on FOX News about her feelings toward the maid "an illegal immigrant" she fired; and Miami Heat basketball player LeBron James' new Nike commercial. 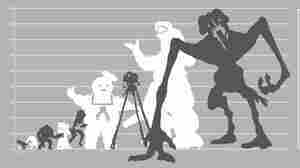 October 29, 2010  Did you know that the Stay Puft Marshmallow Man from <em>Ghostbusters</em> is nearly 100 feet tall? A chart from Geekstir plots the height of great movie monstors, from Chucky to Godzilla. Who's the biggest of them all? October 29, 2010  The national debate over health care has focused on paying for insurance, but James P. Pinkerton of the National Review argues that our dollars would be better spent in research and development so that we can cure diseases, and not just treat them. October 29, 2010  The Affordable Care Act, often called the health care overhaul, is under the threat of repeal by House and Senate Republicans. Harold Pollack of The New Republic argues that if President Obama wishes to work with the GOP on funding the policy, he should turn to the governors, who are held accountable for the uninsured in their states. October 29, 2010  Writer and activist Arundhati Roy has recently come under fire from the Indian government for her comments condemning the Indian occupation of Kashmir. Anuj Chopra of Foreign Policy argues that Roy's interpretation of the conflict was correct, Kashmir is under a brutal occupation, and silencing Roy won't solve that.